Fifty years ago, the TTC was considering a subway line that would begin on Queen Street downtown and run in an L-shaped route east and north to connect to the Danforth Subway. Initially this might be operated with streetcars, and later be converted to a subway. A variant on this scheme appears in a 1973 TTC drawing showing the line continuing north through Thorncliffe Park to Don Mills & Eglinton. This is not exactly a new idea, and it must be remembered that, at the time, there was a lot less of suburban Toronto than exists today. Where Would a Queen Subway Go? Where Would a Don Mills Subway Go? Needless to say, these proposals sat on the shelf for various reasons. One big one was cost, especially as there were competing proposals for other lines like the Spadina and Yonge extensions. Technology debates were another issue, and at one point the line might have been built with the technology used for the Scarborough RT (including some appalling proposals for an elevated structure in the heart of downtown). A future reduction of subway headways using Automatic Train Control (ATC) to as low as 90 seconds (compared to the current 140). The scheme for Bloor station has subsequently been abandoned because of its complexity, but there remains an idea to add a new platform at Yonge station (on the Bloor line) much as a second platform was added at Union. This would separate eastbound and westbound traffic onto separate platforms each with its own circulation elements to the Bloor station above. Come the 1990s, a major recession cut 20% off of TTC ridership, and the problem with subway crowding vanished. In this context, the idea of extending the line north ceased to regard capacity as a limitation, and momentum began to build for this option, especially in York Region. Reducing headways to 90 seconds would yield a capacity increase of about 50% (40 trains per hour vs 26), and this supposed extra capacity was routinely cited by TTC management as a preferred alternative to the cost of a Relief Line. This argument continued well into the 2000s even as the Yonge line started to fill up with new and returning riders. The new TR trains are already in service, and their additional capacity has been eaten up by latent demand on the subway. The ATC project now underway is expected to complete in 2019, but the TTC has now reduced its potential benefit to about 28% based on a minimum headway of 110 seconds, a substantial change from their earlier hoped-for 90 second headways. Traffic diversion to the extended Spadina line is limited, about the equivalent of one trainload of passengers in the peak hour. While the TYSSE will no doubt benefit York University as well as future developments in Vaughan, it will not do a lot to help with congestion problems on the Yonge line. The headroom for growth assumed in the 2012 study has been consumed (TR trains) or reduced (ATC) pushing up the importance of a new line. Combined with the loss of ten years thanks to projected demand from a Yonge extension, what was once a distant project has assumed a new importance. Back in the 1980s, the congestion problem was viewed as having one place, and one site where a “solution” was required: Bloor-Yonge station. The situation today is much different in that demand flowing south on the Yonge line now causes backlogs of waiting passengers well north of Bloor, and this will not be helped by diverting riders around the Bloor-Yonge interchange. What is needed is the interception of riders before they even get to the Yonge line, and there are two options for this. The route is comparatively slow, and significant works are required both to flood-proof the route and upgrade it for more frequent, bidirectional service. It is worth noting that this corridor is not part of the GO/RER network expansion now underway. Train service from Richmond Hill now operates half-hourly in the peak period. Reducing this to a 15 minute headway would add only two GO trains’ capacity to the corridor. This is not trivial, but it is no panacea either. Frequent service north of the York Subdivision (the CN line parallel to Highway 7) must complete for track time with freight operations. Fares on GO trains are not competitive with the TTC, and it is clear that York Region expects a “TTC fare” from Richmond Hill to downtown much as they will get a single fare from Vaughan Centre. Shifting traffic to GO is difficult when a more frequent and cheaper option is available. The other is a line within Toronto paralleling the Yonge subway to the east much as the Spadina line does to the west. This is the extended version of the Relief Line (now dubbed the “Don Mills Subway”) that would run north to Sheppard. Although this line would be expensive to build, the projected diversion of traffic off of Yonge is very substantial according to the Metrolinx study. However, a problem remains on the Bloor-Danforth line where riders are unable to board during peak periods inbound at stations close to the core, especially on the Danforth side. Intercepting traffic that now feeds into the Danforth subway via buses with a subway line further north could reduce Danforth demand. Some reduction might also come from the “SmartTrack” service on GO/RER with rides at a TTC fare from Scarborough stations to the core. Discussion of subway congestion focuses on the AM peak and inbound travel. However, there is a big problem outbound in the afternoon that additional subway capacity can address on the YUS line. But this will trigger a problem for the BD line at its transfer stations, Bloor-Yonge and St. George, where more frequent YUS service will now deliver riders at a faster rate wishing to transfer to outbound trains. Station capacity and transfer demand is not just an issue for the AM peak inbound, but for the PM peak as well. A similar problem will develop at the well-used stations south of Bloor where a 110 second headway of trains will deliver passengers to platforms at a rate 28% higher than today. Some of these stations are quite constrained for exit capacity, especially if pathways are constrained or out of service (e.g. for escalator repairs). If the operating speed of a line can be increased, the number of trains to provide a given level of service drops, or more service can be provided with the same number of trains. The TTC has settled on a “typical” operating speed for its trains ever since it abandoned “high rate” operation on the Bloor-Danforth subway many decades ago. This decision was taken because equipment then in use (the “H-1” trains) developed severe mechanical problems when run at high speed. Higher speed also increases the demands on track maintenance. Any change in operating speed requires (a) equipment capable of faster travel and (b) a decision to invest the necessary money in maintenance. Station dwell times can be reduced only if the demand for boarding and alighting goes down. This is achieved either through lighter demand (and less friction between passengers in cars and on platforms), or by separate loading and unloading platforms. Neither of these is practical for the existing system. Turnaround times are affected both by the track geometry at terminals (which dictates the length of time trains can block each other from entering and leaving), train length and operator behaviour. The latter can be a major problem if a crew is not ready to take a train out of the terminal when it is ready to leave. One Person Train Operation, a TTC goal, may trigger further problems because an operator will have to walk the length of the platform to change directions. Turnarounds are also affected by scheduling, and riders are already familiar with queues of trains that build up on the approaches to terminals. This arises from excessive scheduled running time and trains that typically arrive “early” with no platform available because earlier trains are waiting to depart. As scheduled headways get shorter, the ability of a line to absorb padded schedules will dwindle. The TTC’s Fleet Plans for its subway lines do not provide for all of the potential changes, or at least not on a timely basis. There are two types of cars, the Toronto Rockets or TRs on YUS, and the T-1 cars on BD. Some T-1 cars formerly operated on the Sheppard line, but they have been replaced by 4-car TR sets. The TTC’s fleet plan for YUS is shown in the table below which is taken from the 2017-2026 Capital Budget “Blue Books” Section 4.12 (Subway Car Purchases). This plan shows an addition of six trains for the TYSSE’s opening, and that will provide service with every alternate train running through to Vaughan. The turnback point will likely be the pocket track at Finch West station. In 2020-21, six trains are added to provide additional capacity and exploit ATC. Note that this is less than a 10% increase, not the 28% routinely touted for the post-ATC environment. The basic problem, as is evident in the chart, is that the TTC does not have enough trains to make a 28% increase in service on YUS. Therefore, it is not valid to claim that this represents headroom for ridership growth at least until more trains are procured. There is an unfunded $287 million project in the budget starting in the late 2020s to build up the fleet with 10 more trains. Note that 5 of these are earmarked in the plan above for introduction in 2027. Once the TYSSE opens and the service requirement is 63 trains, a 28% increase would be 20 trains (including spares) less the buffer of 4 “contingency” trains available in 2017. Therefore, the TTC’s plans do not currently include enough equipment, even out to 2031, to fully exploit ATC or provide all of its claimed additional capacity. Additional trains require storage space, and this will be provided both at Wilson Yard and at a new storage area at Richmond Hill station, but the latter would not be available until that extension (for which there are no trains in the plan above) opens. 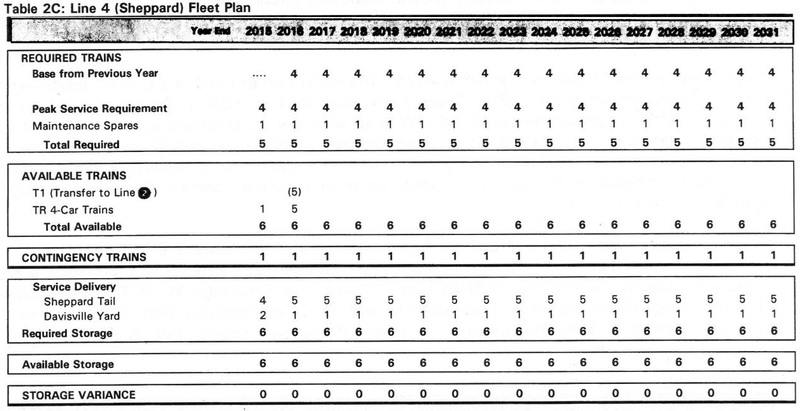 The fleet plan for BD is rather odd in that it reflects a point when the Scarborough Subway was intended to open earlier than its now-projected 2026 date. A related problem is that the T1s would be expensive to convert to ATC operation, and yet the Scarborough extension will almost certainly be under ATC control. The TTC has not explained how they plan to deal with this situation. ATC conversion of the existing BD line is planned for the period immediately after the YUS project completes in 2019, and it would be completed before the SSE opens. There is no room at Greenwood Yard for additional trains, and moreover “unit” trains like the TRs, which are planned for BD, will not fit in some of the existing yard and shop layout because Greenwood was designed around two-car sets. The City/TTC are in the process of acquiring property for a new yard near Kipling Station, and this would substantially take over the function now provided by Greenwood for the BD line. The Capital Budget does not include any money for construction of the new carhouse. Depending on the timing of the new subway car order for BD, this facility could be needed in the early 2020s if the fleet is to be in place for opening of the SSE. TTC management expects to present a consolidated plan for renewal of Line 2 BD to the TTC Board in July 2017. The timing of projects within this plan will be critical as they will affect overall capital spending patterns and could bring projects that have been “parked” beyond the City’s ten-year planning window into the current period when funding is tight. With the acquisition of the new TR trains for Line 4 Sheppard, there are no plans to increase service on this line in the foreseeable future. Greenwood also hosts part of the work fleet, and more could be based there once the BD line’s fleet is operating primarily from Kipling. Another potential use for Greenwood would be to host trains for a Relief line that would almost certainly use the shorter 4-car consist now seen on Sheppard. The value of projects in the pipeline and on various wishlists considerably exceeds the available capital. Cost sharing agreements with other governments, such as the Federal infrastructure program, can trigger the need for the City to pony up its share for projects that it might not yet have included in its spending projections. There is a bulge in approved capital spending that prevents the addition of any new projects to the pipeline from 2018 until the early 2020s unless additional tax revenue, borrowing room or external funding becomes available. These considerations affect not just transit projects, but all capital works the City might undertake notably major road projects or renovation of public housing stock. This article has reviewed the situation for subway lines, but there is a long queue of transit and non-transit projects threatened by the City’s funding limitations. The situation is not unique to Toronto, and both provincial and federal programs push a lot of their proposed funding into the future when, they hope, financial times will be better and they can afford to be generous. But spend today? Not happening. A common refrain heard during budget debates is that the City should simply let the private sector take over the projects. This is not necessarily a good idea because the private sector cannot borrow as cheaply as the City and typically wants to make money on anything it does invest on the City’s behalf. Also, there is a substantial layer of cost and complexity to managing the contract that must be measured against any imputed savings from the partnership. These arrangements are not a one-size-fits-all solution, and in any event deal with marginal savings on projects, not on the much larger overall funding needs of big ticket items like a Relief line. Partnerships are a financing mechanism, a way to offload some of the immediate costs of borrowing and to transfer some risks associated with project delivery to a separate entity. But there will remain the ongoing cost of paying for that investment and its operation. How Quickly Could We Build? A common question about the Relief line (or any other big project) is “why should this take so long”, especially when we see cities elsewhere in the world building new lines at a much faster rate. Part of the answer is technical – local geology and construction complexity – and part can simply be the benefit of a city having an established tradition and team of building that just never stops. But a big part of the problem is financial. Toronto’s endless debates about rapid transit spending have always had a “who goes first” quality to them. Everyone wants their project to be at the head of the queue because they “deserve” the first of any new transit spending. Sheppard West station (formerly Downsview) exists simply because it was common to competing demands for a subway extension either north to York U, or east along Sheppard (a perennial favourite of local Councillors who talk of a “North York Relief Line” with straight faces). One of the hoped-for benefits of the Transit City Plan, leaving aside the debates over technology, was that it put many lines on the map at one go, with the intention that they all be built in a timeframe people could believe in. Alas, that was not to happen, and we are left with a Scarborough megaproject elbowing everything else out of its way. Toronto should be able to build a Relief line in less than 14 years, but this would require the commitment of political capital (“this is a city building project”), and investment on an accelerated scale. The Crosstown project includes 10 kilometres of tunnel and many underground stations, and it is not taking 14 years to build. The question that should be asked is this: if we wanted “Relief” sooner, would it be possible? What prevents us from having a new line in, say, 10 years? The answers may not be palatable in that the folks who are squashed onto subway cars never seem to be around when blowhards campaign against “runaway taxes”. If Council really does not care to improve transit, except in the backyards of a few key wards, then it should say so. But as long as any newfound money is immediately blown on this week’s pet project, Toronto will always wonder why the things we need never get built. This entry was posted in Downtown Relief Line, Transit, Yonge Subway Extension. Bookmark the permalink. Lets hope whatever plans are drawn up are better than the corner cutting “pet plans” of the past which have left the door wide open. Funding should be the number one priority as we should already have a good idea of what the next wave of plans will ultimately be even if they are neutered to slight altered. “Relief” should have been delivered already. But, as Steve tells us, the political so often gets in the way. Even if relief is delivered in the east with the “Relief” line, further extension to Shepard is needed. This is what builds a network. If not, the pressure on YUS above Eglinton continues. The idea of further expansion to York would only put more pressure on the line. The idea of network is sadly lacking in Toronto, it’s fine to think we can build a subway to Richmond Hill, but what happens when the line is down. Connectively needs to be enhanced when plans are put forward. The TTC will also have to do platform doors if they want to run 110 seconds headway. When platforms are crowded, accidents happen. If one person falls on to the tracks, it will be a massive delay on the system. Platform doors also make the platforms slightly larger as people will no longer have to stand behind the yellow line. They can stand right up to the platform door safely. Mr. Tory is taking a stand that the relief line must happen before the Line 1 extension. However, he will now has to find the money. No one knows how much money Mr. Tory is on the hook for. When Smart Track is finished, the city might have to pay GO to carry passengers inside Toronto. Why would someone board a GO train at Centennial GO, when boarding at Unionville will be much cheaper at a TTC fare? Will the TTC pay Metrolinx to run trains (or track time) on Smart Track portion of the tracks? Will the TTC pay GO a subsidy so that customers boarding at Unionville pay a TTC fare instead of a GO fare? Every level of government seems to have their own transit portfolio to fund. Even if the federal government spends $50 billion on VIA Rail, it still won’t be enough. $50 billion might buy just a high speed corridor between Windsor and Quebec City. The Canadian and Ocean might still not be a daily train. Nova Scotia wants a daily service between Halifax and Moncton in addition to the Ocean. There are so many competition for money everywhere in the country. Mr. Tory will have a lot of work convincing the federal and provincial government. Mr. Trudeau does not come to Toronto and say “let’s build, we got your back”. Ms. Wynne won’t spend any money because she wants a balanced budget forever (or at least until another Liberal majority). While relief may come in 10 years, we are taking a long time to build anything. In Riyadh, 6 metro lines will be completed by 2019 and those were only approved in 2013. If Toronto wants to have transit fast, stop on insisting on underground tunnels. Guideways are much easier to build and faster to finish. Cut and cover construction will also be much faster, but it is taboo now. The Paris Metro was built this way. Transit might simply be too big and difficult for municipal politicians to deal with. By all means the funding from senior governments is inadequate but what Steve points out as political obstacles mainly comes from city council. Indeed if they can say with a straight face North York Relief Line well.. I don’t have much hope. I am glad Steve you point out the inherent problems with the private sector and indeed financing is a big one. We are going through this in Ottawa where we now know thanks to the work of some on city council that it would have been cheaper to finance this ourselves. Another issue is once you sign a contract with a private company to build and maintain (operations remains with the city) it’s difficult for us citizens to know what’s going on and how the money is spent. As much as I don’t like the idea of shifting transit to the Province (there are drawbacks) I am beginning to rethink my views. Planning in Ottawa just like Toronto was plagued by the pet projects of councillors (we were saved only because the BRT was built over 25 years ago but that too causes problems) and by moneyed interests. Cadillac Fairview demanded and got a station at its shopping mall. Yes it’s nice it serves the Byward Market but the geology there makes it hard to build and I suspect hard to maintain. We don’t know because they won’t tell but their silence is deafening. So I hope Toronto won’t do the same mistakes we did. But I suspect that it’s the same political game in either cities. Steve: The last thing Toronto will want is a provincial upload once Queen’s Park says “fine, but here is the amount we expect you to contribute to the TTC’s operation” just as they now ask for money toward GO Transit’s capital program. It is quite amusing to thing that Queen’s Park would take on local transit for free. Another important point is that service standards would then be dictated by the province, and would likely be considerably worse than the level of service Toronto now expects. We could get more, but there would be a fee. Awesome analysis so I hesitated before mentioning this but OPTO is not an issue at least when it comes to reversing trains. Montréal and other systems simply have an operator at each end to assist in the reversing process. It’s quick. Still, spectacular analysis. Many lessons to be learned. Steve: An operator who was at the “east” end of a train still has to walk to the “west” end. Unless sufficient extra staff are provided so that this does not hold up service, it will be an issue. This will also be a problem for emergency turnbacks enroute as well as “on the fly” crew changes between trains. Uh-huh. So how do the people on the train, who want to get off, actually get off? Steve you are right Queen’s Park would rather not take over, not directly but it’s meddling a lot and we are paying more and more for less and less. So they are already putting a lot of conditions in order to get funding and it’s not good. Maybe the TTC is free of such interference but in Ottawa they meddle plenty and not just with Presto. This is the context that leads me to change my views about who should run transit. As for operator change I agree with emergencies and operational flexibility but in terminals they don’t walk. The incoming operator gets out while the terminal operator takes over. The terminal operator runs ands stops near the end of the train so that the incoming operator gets in the cab at the end of the train. They reverse the train and the terminal operator gets out. He or she is the only one to walk and that is across the tracks. This makes rotating crews easier and gives them breaks. The father of a friend of mine used to operate for the STM and he loved it. He hated line 4 which had an operator at each end because the breaks were few and far between compared to the other lines. There’s probably a YouTube video that shows how it’s done. But in an emergency having that second crew member counts. So it’s not a straightforward decision to remove the second crew member. I am glad to see the issue of construction cost and speed finally getting some attention. If we were able to build as quickly and as cheaply as say, oh just about any city in Europe, then a lot of these “who goes first and where” debates wouldn’t happen in the first place. Steve has previously written about why it’s hard to directly compare construction costs. However the latest estimates I read in the press for the Scarborough and Relief lines make me shake my head – they appear to be setting a world record on a per km basis, with the exception of the 2nd Avenue subway in New York, the cost of which has been widely derided. P.S. I’ve always wondered why Toronto subways crawl along at roughly 50 km/hr or less, Steve explained why above. Hardly “rapid” transit, and something I find irritating as a frequent user. Benny Cheung Writes: The Canadian and Ocean might still not be a daily train. Sorry to stray off topic but as far as the Canadian is concerned, this this has as much to do with running rights through the Rockies and the Rocky Mountaineer’s interference as it does VIA’s budget. You think VIA wants to run 30-car trains? No amount of money will fix that unless you want to build new track through the mountains. A little strong arm is necessary. An important part of honesty in subway planning is to dump the “one silver bullet” attitude and develop a network thinking attitude. This means thinking about how everything works together and how each project affects the entire network. For example, Mayor Tory is right to point out that there is no capacity on the Yonge subway for the additional passengers that would arrive as a result of any subway extension to York Region. However, the exact same thing is true about the Eglinton Crosstown, and I do not see Mr. Tory vowing to block the opening of the Crosstown until the Relief Line is completed. The reality is that as soon as the Eglinton Crosstown opens, there will be a large number of people riding on it from east of Yonge to the Yonge subway. But when they arrive at the Yonge subway there will not be capacity available for them. OOps! During the AM peak, anyone trying to board at any station south of Eglinton will be out of luck. The problem is that there are currently a lot of people south of Eglinton who rely upon the Yonge subway to get to work. Rest assured, they will be mightily unhappy about no longer being able to get to work. Although I generally dislike Karen Stintz, she did understand how to build a subway. You call a meeting, you vote for a city-wide tax increase to pay for a subway, and then you agree to build it. Of course, the Scarborough subway was later found to be way more expensive than originally projected, but I admit that she was able to set things in motion quickly. No one is going to take John Tory’s talk about the Relief line seriously until he’s willing to do something like that himself. Today’s New York Times has a story about having to convince the state governor to do something for the NYC Subway since he is in charge. They need to upgrade (what they call) a 1930s signalling system. One line done last year, one for this year; they say it may take 50 years to do the whole system at that rate. One line last year and one for this year? The 10-mile Canarsie Line (L service) was chosen as the pilot upgrade to CBTC, with work beginning in 2000 and completed about the end of 2006. It was chosen as the pilot partly because it is a relatively short line and partly because only one route uses the line. The second CBTC upgrade was the Flushing line (and its 2015-opening extension), which like the Canarsie line, is home to only one route (7 and its express). This had a slightly shorter implementation time span, being covered in the capital budgets from 2010 to 2014, though additional work continued a little longer for the extension. Granted, lessons learned on these projects will enable future projects to proceed in less time, but there is a significant amount of time needed to re-signal a line. And yes, NYC has a fair bit of 1930-era components in their signalling system. Aside from parts not being available (though, lines being upgraded will free up some equipment for that purpose), much of the wiring has cloth insulation. If there was a fire in a signalling equipment room, it would make the recent hydro vault fire here in Toronto look like a campfire by comparison. It is clear to all that the Yonge line (Finch to Union) is running from near to beyond capacity. Adding the connection to the Eglinton LRT (EgLRT), and building the SSE will only add to the problem. The major choke point is Yonge/Bloor, as it is the main transfer from N-S to E-W.
Steve: Actually, there is a choke point north of Bloor too that grows worse as demand coming in from the north rises. Elimination/redirection of trips that now attempt to transfer at Bloor-Yonge will affect both crowding at the interchange for transfers, and relieve demand on the line further north, provided that the DRL goes far enough, as you note below. All the relief that the Spadina arm can provide with the extension to VMC is a few train loads. All the studies show the only true relief will come from building the Don Mills (DMS) line. Section 1 – Queen to Pape is starting to get priority, Section 2 – Pape to Eglinton is starting to be a planning priority, Stage 3 – Eglinton to Don Mills is still a gleam in Steve’s eye, Stage 4 Don Mills to York Region is crayon on paper. Steve: I think pushing north of Sheppard is a real stretch today, and the question remains of how much capacity can be squeezed out of the GO Richmond Hill corridor if we are willing to spend the money on it. There is also the question of whether we should simply keep building subway further north, or look again at the idea of an LRT network for York Region. But York Region is starting the push for the Richmond Hill extension to the Yonge line – to me it would see more logical to look for an extension to the north (DMS stage 4) from Don Mills to Steeles (dip under the 404 and run north under Woodbine to 7? ), as a better long term goal. Having both York and Toronto on the same page, not working at cross purposes would result in construction, not conflict. Building the DMS is a necessity, but will take time (20+) to build. So I ask what short term pressure outlets can we find/implement? Most of the transfers at Yonge/Bloor are N to E/W and E to N/S, most western riders are assumed to change at Spadina or St. George and ride around to avoid the “hassle” at Y/B. 1. A shuttle bus from Rosedale station via Crescent Road, to Sherbourne Street (Sherbourne Station w transfer), to Wellesley Street (Wellesley Station ) and run back the same way again. This would be a continuous loop, running express from station to station to station. This offers an alternate N/E, S/E and E to N/S connection. 2. Extend the streetcar tracks on Parliament to Castle Frank station. Looping via Queen, Victoria, Dundas or King, Wellington. York, Queen would provide the E/S and S/E link. By wrapping the streetcars in custom livery (red rockets with flames on the back) they could run express from the core to Castle Frank to provide a competitive link. I like streetcars and this could be done with buses, but the streetcars give more capacity with lower headway. Steve: Both of these suffer from capacity limitations and from the problem that the transfer point is too close to Yonge. That is particularly important for outbound trips that would attempt to board at Sherbourne or Castle Frank where trains are already packed. An “express” streetcar from Castle Frank is not really going to be very fast because it will run in mixed traffic on Parliament. 3. Victoria Park BRT to Markham. Running from Victoria Park station to some point in Markham (Hwy 7?) this would provide a eastern link running N/S that could easily tie into EgLRT and reduce pressure on line 1. Transfer pressure may increase at Y/B or St. G/B interchanges, but this should lower loading on the north Yonge trains. The advantage to this route lies in the fact that it can be implemented quickly and stay up and running, undisturbed by construction of the northern stages of the DMS line. Steve: Reducing pressure on Line 1 by connecting to the Eglinton LRT? Er … and just how is putting passengers on Eglinton supposed to help the Yonge line? If they come down to the BD line, they just add to the problems from the Danforth subway. 4. Build the Sheppard line to connect with the York-Spadina arm of the YUS. Split the line north of Wilson so half of the trains run to VMC and half go to Don Mills. This is a long term goal of TTC schedulers and maintenance to ease running the YUS, but it would increase ridership on the Sheppard and York/University lines. Build DMS stage 4, and you have a circuitous route to downtown. And with the Sheppard line tied directly to the Spadina arm, would the transfer at Yonge/Sheppard be worth it? 5. Double track Go Richmond Hill line for 2-way operation to Old Cummer (Langstaff if possible 3 or 4 track to keep CN happy), run this as an all-day service at TTC x 2 rates as this would be a premium direct to core route as an upcharge is viable. Load levels may allow single track operation with a RDC type unit. Steve: If the load levels are low enough that RDCs running at the headways a single track could support will not make a dent in demand on the Yonge line. 6. Convert the old CP line from Union to Leaside (Eglinton/Leslie) the same way, but run at TTC rates to encourage EgLRT riders to bypass the Yonge line for the faster ride to Union and ride North from there. Steve: There are big problems from Leaside eastward because this is the CPR’s main line. 7. Get GO to fast-track RER on the Unionville line. Ask them to focus on full day service to at least Agincourt, again this provides another eastern link running N/S to draw off more ridership. Steve: Work on double-tracking parts of this line is already underway, but there are issues where GO parallels the SRT about the amount of room available for concurrent operation. The SRT is to remain in service until the SSE opens in 2026 (if you believe in the tooth fairy). I am not saying we could do any or all of these, but it is a starting point for discussion. On a different note, while a DMS stage 2 route is expected to be Pape to Thorncliffe to Flemingdon Park to Don Mills – this route requires one, maybe two expensive bridges. Could Pape to O’Connor to Victoria Park – requiring one bridge be a cheaper alternative. I am not sure of bridge vs tunnel cost, so I ask. Possibly this route is too easterly and would steal ridership from the GO RER/Smart-track line to STC. However it would make turning into Don Mills easy, or allow Spanish style stations at Sheppard and Victoria Park to allow easy transfer to the Sheppard line and make train turnaround timing simpler. If York Region had to forgo the Yonge extension, and had to opt for a more eastern link, would they choose, Don Mills, Victoria Park, or further east? Steve: You would take a more roundabout route and would miss several key centres: Thorncliffe, Flemingdon and the Don Mills/Eglinton corner which is about to have major redevelopment. Your schemes seem bent on providing service to York Region when the real issue is to increase capacity to handle demand within Toronto itself, and particularly for trips that are not just downtown-oriented commutes. On the bridge vs tunnel question, bridges are almost certainly cheaper, especially considering how deep the valley is. Thanks again for distilling complexities and crises to simpler principles and problems, along with some denunciations along the way. It is complex, and I’ve held off adding two cents until I think I’ve gotten points a bit more than a skim. I sadly am no longer trusting the outcomes of planning/scheming processes; a review/reset of the large-scale plans by a group like APTA or UITP would be very very good value for any money spent, and with the billions of public dollars possibly squandered, where are some fiscal conservatives when you might like some? I’m thinking we need new corridors vs. continual overload of existing ones, and also, we need to have faster routes (often on-surface when possible), and on existing corridors or remnants (where possible), and done far more quickly to respond to the current overload/crisis vs. maybe in 15 years if there’s funding. The taint and problems of the Suspect Subway Extension are ongoing, and this includes the adjustments to plans and priorities from salvaging up to some credibility the Smart Track layer of the RER. We are firmly ignoring the possible usage of the Richmond Hill GO line and the Don Valley and some corridors there because of the possible floodings, which relates to the great surges in the stormwaters due to all the hard surfaces in the watershed, which is around 1200 sewers and c. 70% of storm surge according to a recent book Reclaiming the Don by Bonnell. The majority of the Council voted to do nothing for another couple of years; close to the same votes as the majority that voted to ignore facts when doing infrastructure projects ie. whims and whatever, are just fine for billions worth of spending. It isn’t merely the GO line, which may be less easy thanks. There is a remnant spur line in a bit of North Toronto that is a bike trail now – and it’s a shortcut. I don’t know it/environs that well, but if we’re ignoring it because of the rich areas that it runs through, that’s not OK. Also, we apparently own the spur line from Brickworks south to near-core, with a bridge over the Don, and a fair bit of land adjacant to the Don Valley Parkway. So one surface relief measure/idea I’ve been seeing is re-use of that spurline, perhaps for bi-directional relief, despite the narrow bridge (which signalling may allow use of), to get near Thorncliffe Park, and have a Redway transitway to link up to Thorncliffe. Steve: I really have to jump in here. There is no “remnant” spur line — it has been a bike path for over a decade. When it did have track, it was single track and had a level crossing with Lawrence just east of Leslie that would be difficult to eliminate given the geography of the location close to the intersection. Reactivating this would put frequent service right through the middle of a residential neighbourhood. It’s income level does not matter, although I am amused that you of all people would advocate getting rid of a bike path. Maybe we should rip out like the West Toronto Railpath or the path on the west side of the Don beside the Bala Sub if it would suit your plans. That narrow bridge must be replaced as it is not structurally sound. The biggest problem operationally is the need for anything coming up the Don Branch (the ex-CPR line on the east side of the valley) to cross the CPR’s mainline at Leaside to reach the former spur. This has all been covered many times, and quite bluntly I am fed up with how often this resurfaces as a “solution” including on some professional produced maps. Further flights of imagination are a new bridge to the centre of the DVP from Thorncliffe Park to create a loop, and use/re-use the DVP for transit as there is a relative LOT of land there, and we could maybe drop in a centre-lane reversible transitway modelled along Jarvis St. lines. If it works for a few cars/people on Jarvis, why not have this same idea for more efficient transit?? (“Because” is not an adequate answer, though our broad carruption is such that I’m sure some people will be quite happy giving that answer). This piece of Relief would bypass Bloor/Danforth yes, but isn’t that a Good Thing? And with another bridge (transit-only, though maybe bikes/bladers/boarders/peds too), if we got something faster/surface up to Thorncliffe Park, (which has high transit demand/use), we are quite close to Don Mills Road at Eglinton. So maybe we could drop in an LRT, or a busway to have higher-capacity surface transit zip in to the core for surface Relief, done faster. Of course if one looks at a map, and if one could imagine another bridge, from Thorncliffe to points east and northeast, there’s another very broad, wide, really sparsely used corridor that shall have no name, but it seems like a comparatively cheap and easy way to enable faster surface transit even within Scarborough, along with the inherent virtue of faster travel by the diagonality of it. We could also boost express buses, and to be really roadical, we could analyze the people flows on the Yonge St. corridor ie. subway, road, sidewalks, and tally up fees paid for the relatively mobility, and we might realize that actually the subway riders pay an awful lot of coin for below-ground travel, and the clogged streets are given to vehicles that some can see as road hogs. So we could drop in a Jarvis-inspired transitway in some parts of Yonge, and even where it’s very narrow c. St. Clair, maybe Davisville), we should be able to prioritize transit on-street, at least during rush hours, and give up the central space/lane for deliveries and a bit of on-street parking when the subway is slightly more operational. And yes, bikeways might help, though far less on Yonge St., but more likely on Danforth and on Bloor, and we could also see/use something east-west in extending Richmond/Adelaide. Of course there are some other things: but the 1/3 of “Relief” (compared to the 1985 DRL) that might be arising with the Relief stubway, is absolutely NOT going to fix things on the Yonge line NofBloor, yet it really does need help/options. And it’s good to have the extra ‘misses’ of not enough trains for ATC, and oh, it’s another cost for this and that, including altering the B/Y platform for some massive sums, sometime. And meanwhile,the City can’t manage repainting a tiny bit of Bloor St. E. between Sherbourne and Church for about $25,000 that was in the 2001 Bike Plan, and is one of those missing links that discourages more than a few cyclists. The current crowd of rulers seems to not want bikeway relief, and it smells like the bikes are too much of the competition/good value, so it’s just fine to keep it dangerous as the City/TTC makes money from the overcrowding in the core etc. to help support suburban services. Going back to a review, what a shame that the $150M for the ‘planning’ of the DRL can’t be tithed to the APTA for a good funded review of everything, to make sure we have planning that isn’t smelling tainted, which is a shame to say, as we’re getting towards planning, and there’s sure been a LOT of work put into things. But Fordwards was so so backwards, it’ll take at least this term to emerge from it; too bad the current leaders can’t smell as much off as some of us. Graham writes: 1. A shuttle bus from Rosedale station via Crescent Road, to Sherbourne Street (Sherbourne Station w transfer), to Wellesley Street (Wellesley Station ) and run back the same way again. This would be a continuous loop, running express from station to station to station. This offers an alternate N/E, S/E and E to N/S connection. Have you actually tried this out? While transferring to a bus at Rosedale and Wellesley stations isn’t too bad, Sherbourne is an awful transfer that requires a traipse up several flights of stairs and then crossing the street to catch a southbound bus on Sherbourne. The layout is already inconvenient for patrons of the 75 Sherbourne bus, many of whom make the perilous dash across several lanes of traffic plus bicycle lanes instead of walking the extra distance to cross with the light at Bloor. Why anyone would “volunteer” to transfer at Sherbourne is a mystery to me. Crescent Road is full of four-way stops. Wellesley Street east of Yonge regularly gets jammed with traffic both eastbound and westbound. That “express” loop will take maybe fifteen minutes if you’re lucky. To add to Steve’s point about capacity, in peak hours there’s a train roughly every 150 seconds on both Yonge and Bloor lines. You are only going to make a decent dent in the crowds if you can convince, at a minimum, say 150 people to use this “transfer-bus” scheme. That’s two buses worth, so now you’re trying to run shuttle buses on a 75 second headway. Leaving aside the reactions of Rosedale residents along Crescent Road to the prospect of a continuous stream of buses (under 40 seconds for a bus in one direction or another), I can assure you from experience that trying to load 75 people onto an Orion VII, using all-door boarding, is going to take longer than your headway to accomplish. Even more if others are trying to get off the bus. I know that Steve rightly criticizes fantasy transit schemes drawn up on a napkin. (Someone elsewhere is proposing joining up the Sheppard subway, Don Mills line, and the notional Jane LRT in a giant U, for example.) But at least they are a vision of a utopian system, assuming money was no object. This scheme of making people take a bus to transfer between subway lines is a miserable one; the experience will be miserable for riders; it will take more time for the totally miserable experience….seriously, how would anyone expect anyone to “volunteer” for this experience? Thanks for comment space, and comments. I’ve been a skunk within the bike community at times for things like advocating (or being OK with) squeezing the Rail Trail on the Weston line IF we could get adequate TTC-based transit AND a good on-street bike network in the west end as highest-best use of scarce land likely is, and should be, for transit. That said, the Rail Trail is a delight at times, but perhaps the eventual solution is to have the bike path atop a transit usage. Some century…. And so yes, with that shortcut that is now a bike path in mid-Toronto, if it helps improve the transit, we need to add it in to the mix of options possible. Also, there is likely real decay within that bridge structure by the Brickworks, but the base looks nearly indestructible, though if neglect at the top of the piers continues, that’s destructive. But much of our transit work is doing construction work and using concrete, so we have to think of having big works occur. And what’s the phrase – where there’s a will, there’s a way? I know it doesn’t apply to better biking (for the most part); and the fetish for subways is to remove transit usages from above ground and the road, as roads are for cars, right? #1 – With all of those residential buildings in Thorncliffe Park, where/how would you tunnel underneath that little “raised” island of a neighbourhood? #2 – Where would your portal be on the Thorncliffe Park side if you did a bridge? The “Don Valley” is literally like a Grand Canyon between traditional East York (O’Connor and south) and Thorncliffe/Flemingdon Park. Steve: I would aim at a roughly diagonal path entering at the southwest side of Thorncliffe and swinging more northerly under the parking lot and mall building. It should be remembered that there is a good chance this project would trigger some reconstruction of the commercial space and we should not make assumptions about the buildings. It’s tight but not impossible, although construction close to the surface (as implied by a bridge) might be cut and cover which requires a finesse between existing buildings. From Overlea and Thorncliffe Park East, I would go under the road until a point where it would be possible to swing north behind Marc Garneau Collegiate to wind up under Don Mills. There is more than one way to draw this path, and I’m not going to get into the details. That’s what we have engineers for. However when I consider places the subway already has bridges — Rosedale Valley Road, Humber River, Sheppard East at the Don, and on the YSE over the Don River in York Region (proposed), this is not a show stopper. #3 – I know it would be very very very deep but is it possible to just tunnel under and have a super-deep station (a la Tube in London) in Thorncliffe Park or would the environmental impact be much more severe trying to tunnel under the Don? #4 – Would the incline be too steep for a subway car if you had to tunnel beneath the Don through Thorncliffe Park as you curve up into Don Mills heading to Eglinton? Steve: I don’t know the elevations, but suspect this would be a big problem. Also a super-deep Thorncliffe Station is probably a bad idea both for cost and accessibility considering how busy it will be. I’m not a geologist and I know the area well… the section that has the highest “per km” construction cost will be as you head out the ridge north of O’Connor until the DRL reconnects somewhere under Don Mills Road. It will be interesting to see how they tackle it without making everything look like a total eyesore. John Tory just announced today that Roadway construction will be accelerated on several projects, at a cost premium of about 20% in order to reduce inconvenience. Maybe they can use cut-and-cover to reduce construction time. This would likely save ~50%, instead of costing more as it does for the roadway construction. Look at Eglinton – station construction is (or soon will be) ~150m long and spaced every 800m. This is a massive amount of disruption and the entire corridor may as well be a giant construction zone. May as well have the stations much shallower so they can be completed quicker. With the money estimated for DRL short, they could likely get up to Sheppard if Value Engineering was allowed to find true savings. Short term relief can be provided by moving all the Flexities to be shared between the 505 Dundas and 504 King routes until we have more of those. Sure, the streetcars are slower but a lot of people will take them for a more spacious and convenient ride with nice clear views vs being squeezed in an underground tunnel. I remember a while back people were complaining on this blog when Scarborough residents were objecting to their houses being demolished for the subway and several people on this blog said ‘take it or leave it’ but now for the DRL, the subway is being moved from Pape to a more expensive Carlaw just because as the Citynews news report said, “it will change the character of the neighbourhood” (no demolition of any house threatened on Pape, no noise/vibration issues as new subway will be very deep, but “it will change the character of the neighbourhood”). Why can’t we say now, ‘take it or leave it’? You see the double standard? In Scarborough’s case, houses were threatened with demolition but on Pape, there is no demolition threat and only that “it will change the character of the neighbourhood” and off we move to a more expensive Carlaw option (the Citynews report said that the Carlaw option will be more expensive). Steve himself has stated that the Pape option is the best but I don’t see him condemning the Carlaw option now. As for me, I will support a DRL on Pape or further east but NOT under Carlaw. Why don’t we charge the extra cost of moving to Carlaw to the residents of Pape who don’t want to “change the character of their neighbourhood”? And why did they wait so many years to make that claim (the later the decision to move to Carlaw, the more expensive)? Steve: I don’t ever remember endorsing the Pape option in this context, and actually prefer the Donlands route that has been discarded earlier in the study. As for the issue with houses at Ellesmere and McCowan, I have never espoused a “take it or leave it” attitude. My big problem with the SSE is that we don’t need it, something that cannot argued for the DRL. While we are on the subject of extra costs, there is the little matter of an extra $150 million for a relocated bus terminal at STC. The size and complexity of this terminal is a direct result of the “one stop subway” option that concentrates all surface connections at STC rather than spreading them between locations. You love to slag positions I have not actually taken in your continued portrayal of coddled downtowners versus downtrodden Scarborough residents. Get your facts straight. I hope that people will remember in the election next year that Kathleen Wynne’s Liberals have announced building a Toronto-Windsor high speed train but NOT the DRL. In the decade and a half that the Liberals have been in power, they could have built and opened a DRL already if they had any intention of doing so. Surely, the NDP and the Progressive Conservatives did not build it either but now, we have new leaders for both of those parties and not the ones that lead those parties to power in the past. Steve: Don’t hold your breath for big transit spending from the Tories. As for the NDP, the last time they were in power was a quarter century ago, and their transit “policy” consisted of make work projects to build subways, most of which were cancelled by Mike Harris. Only Sheppard survived to placate Mel Lastman and gain his support for Toronto’s forced amalgamation. This isn’t as much of a subway planning question as it is an LRT planning question…it’s also local in character. Do you know whether any bus line (or corridor consisting of multiple bus lines) in Etobicoke has the passenger numbers to warrant a conversion to LRT? Kipling has always struck me as wide enough to have an LRT line down the middle…buses are pretty full…but what are the actual numbers? Steve: Kipling is busy with a headway below 4′ in peak periods, but that’s light for LRT (15 regular size buses/hour is only 750-800 pax/hour). There is lots of room there for improvement as a bus operation. When the Transit City network was being planned, Kipling was considered but discarded because there were other stronger corridors. Also, does it make any sense to run an LRT west from Kipling Station? To say, Sherway and beyond? Sherway Gardens is served rather poorly by transit. I know long ago there were ideas to extend the BD line this way but that they didn’t add up. The area around Kipling Station is urbanizing at pace in the past few years (The Kip District is the newest project to add to this), not all of those people are going to have cars (I didn’t when I lived in the area), and the Sherway/North Queen strip is the closest shopping destination, but getting there by bus is a bit of a pain. Steve: At one point, the Dundas BRT in Mississauga might have been an LRT, but that has sort of fallen off of the table. One big problem is that the BRT corridor is not longer actually on a street, and it also collects together many routes and does not act as a trunk in its own right. If Dundas were to become LRT, it really needs to generate a lot of its demand locally, not from many feeders. There is also the question of where a logical western end would be. As for Sherway, that’s another destination entirely well away from Dundas. There are big problems in designing/choosing major corridors in Etobicoke and Mississauga because of the suburban concentration (or lack of it) around which transit corridors might be built. Doug Said: I remember a while back people were complaining on this blog when Scarborough residents were objecting to their houses being demolished for the subway and several people on this blog said ‘take it or leave it’ but now for the DRL…. Jabs fly West to East only here. Any questioning portrays you as flaming a “downtown vs. suburb” debate. Yet when Steve says “we” don’t need a subway extension in Scarborough I question who is “we”? Certainly not the overwhelming voting majority in Scarborough. “We” is actually the opinions of “them” and “they” clearly have refused to work with Scarborough in anyway because “they” could care less about anything aside from their unfunded projects and cant move on to see the issues which led to the death of Transit City. So who is really flaming the divide? “We” actually don’t need poor transfer locations in Scarborough. Thanks for your answers, Steve! I have been reading this blog for a long time and continue to be fascinated by the breadth and detail of its content, the depth of the analysis and the effort made to truly understand the topics under discussion. It is self evident to anyone not consumed by a single issue issue obsession that when you say “we” you mean the transit riding populace of all Toronto. In fact, since transit is an integral part of our overall transportation network, you are speaking out in what you believe to be the best interests of all Torontonians. Keep up the great work Steve. Your efforts are an important contribution to the debate and to understanding of complex issues. They are welcomed by me as well as thousands of followers anytime. Since I asked earlier about LRTs … an interesting development from China: the world’s first “virtual streetcar”. Basically it’s a double-articulated bus (though the body looks like a streetcar/bus hybrid, i.e. a modern streetcar body with rubber-tired wheels), that is kept on a fixed route using some form of automatic control (something adapted from automatic train control probably). Instead of rails, sensor along the route and on the vehicle keep it fixed to a “virtual track”. This allows it to be bigger than a bus while requiring less road space and maintaining a streetcar-type top speed (70 km/h is quoted in the video). The fact that it’s route is tightly controlled (and therefore pre-planned) is what I suppose allows it to have the narrower streetcar-like body, since turning radii can be restricted. I know the streetcar like long buses have been designed before for use in bus and trolleybus rapid transit systems, what is new here is the automatic control. Maybe it makes this vehicle more “streetcar like” in behaviour than the previous attempts. The advantage is that you get to save on laying the tracks, and in this case, also the distribution network (the example is battery-powered – I wonder how much the batteries cost over its lifetime though). Obviously this is just the first demo and who knows if this will be viable or rolled out in large quantities. It is though an interesting concept which could make the passenger threshold for LRT-type service drop, since implementing this system should be cheaper than a “proper” LRT line. Steve: At this point, I am not going to attempt a technical critique of something that’s only a promo video, but I couldn’t help noticing that the only shot in the “cab” clearly showed the driver with his hands on the steering wheel. I have little doubt that a self-guided bus is possible, and the real question is whether this can actually scale up to a “production” environment. My biggest worry is that, like every technology wonder that comes along, this could prove yet another reason for politicians to delay on commitment to rail-based transit. The opposition to LRT we see in the GTHA is as much a question of the road lanes lost to a dedicated transit corridor as it is the actual technology, but this masquerades as a “streetcars vs subway” debate. Streetcars don’t generally derail in snow or slippery conditions. They may not start or stop well, but they will stick to their tracks, and therefore their defined path. A rubber-tired automatically-steered bus, in slippery conditions, won’t necessarily follow the guidance instructions. So there is no way you can safely plop it on a narrow right-of-way; at least in Toronto. For a tram bus to work in snow, there would need to be a sprinkler system spraying Glycerol when snow is following. This way, there will be traction for the wheels. Although, the video shows a tram bus using electricity as oppose to diesel. If there are electric motors on each wheel, there will be a lot more traction as traction is available on every wheel. Using a combination of GPS and GLONASS, the tram bus will be accurate to up to 1ft depending on the chipset used. So, even if the line is not visible to the camera for guidance, GPS and GLONASS data can still drive it. A 100+ persons capacity vehicle is quite impressive. Until Line 1 is extended to Richmond Hill Center, it can help to remove the parade of YRT buses between Finch and Steeles on Yonge. YRT in its infinite wisdom did not build a rapidway between Richmond Hill Center and Finch. Even if a metro is being build, it will take many years. Terminate all the YRT buses at Richmond Hill Center and use these vehicles on Yonge Street. The Stouffville Line is now a bidirectional all day service. It will be interesting to see how many riders it siphons off Line 2 . If fewer people get on Line 2 from the east, there will be less people to change at Bloor-Yonge. Too bad for Mr. Tory, the news release did not mention anything about his Smart Track initiative. I hope the TTC will make better connection to those GO stations. For example, the 53E does not stop at Milliken GO station forcing a transfer to a local 53 bus. Likewise, the 190 does not at Agincourt GO either. When Smart Track Finch East and Lawrence East come into reality, express buses will need to stop at those stations too. No one uses glycol to remove snow from the roads. It is slippery and an environmental issue. In any case, if there’s enough snow falling, vehicles will simply have to deal with it. Streetcars have no problems (except at switches which may have to be cleared to confirm settings). Buses can slip and slide, and articulated buses can slide worse of all (granted, current artics are not all-wheel powered). GPS and other guidance won’t do anything for you if you are slipping back down the hill, or off into an embankment. That’s why I consider a “tram-like bus” to be an impossibility in this climate. Sure, you can experiment with self-driving buses, but to imagine that they will always follow their assigned path — like an actual streetcar — to be dreaming. Actually that crossed my mind as well, but I wanted to start off with a positive spin on things 🙂 although I was impressed by the possibilities of this approach, I almost had an ulterior motive: making sure you hear about it first before some city councilor or future mayor touts something like this as a catch-all solution for all of Toronto’s problems. To be clear, I had no intention of suggesting that LRT lines should be replaced with “virtual streetcars”, only that they might in the future be used to bring LRT-like service to corridors where passenger numbers don’t justify an actual LRT line build-out. IF (and that’s still a huge IF) something like this works, I see it as a way to make BRT more LRT-like in its performance. @Ed: I also don’t think there’s a way this would work in a narrow right-of-way the way streetcars in the urban core do, of course. Just to note, there have been a handful of “guided bus” transit lines (none with “virtual” guidance though; all through some sort of rail) installed around the world, none of which have been spectacular successes. Bombardier’s recent version of this (GLT) was installed in two cities in France, Nancy and Caen, and Caen decided after a few years to abandon the concept and just convert it to regular streetcars. P.S. The use of batteries reminded me of another thing. Last year at a conference I met a gentleman from Bombardier (one of its European offices) who was presenting the power train of the Nanjing tram. It’s a modified Flexity tram that runs on batteries, which are charged at each station. That way they say, 90% of the line is free of the overhead lines. I asked him why Nanjing did this. The answer was aesthetics, they thought it was prettier without the overhead, and novelty value (which seems an important thing in China). He said that in a power-out situation, a fully-charged streetcar would be able to loop around the whole line a couple of times (they did a test running “dry” without recharging at each stop). He said the batteries do not take up any additional space compared to the base Flexity model used, as they are on the roof. Alas, he could not tell me whether batteries vs. overhead lines make sense in terms of cost in the long run. It’s too early to conclude, he said. My feeling is that right now, batteries are not more economical (otherwise they would be touting it) but that they might be in the future.